On Friday, Time Inc. will officially become a separate company, completing a spinoff from parent Time Warner that has been in the works for over a year. With a portfolio of more than 70 overseas and 23 domestic magazines — including Time, People and Sports Illustrated — Time Inc. has created a widely renowned publishing brand. But over the past decade, it has also suffered from an economic decline that reduced its revenues by 34% and cut its operating profit by 59%. Time Inc.’s troubles are emblematic of the economic challenges facing the consumer magazine industry. 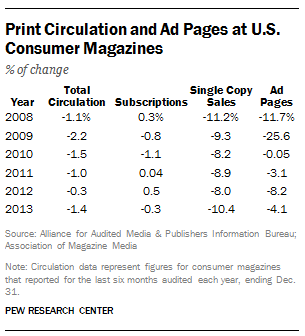 While the digital side of the business has been making some gains, overall magazine print circulation (including single-copy sales, subscriptions and even digital replicas) has been down each of the past six years, while the number of print ad pages fell for the eighth year in a row in 2013. The most recent data show that total magazine circulation dropped 1.4% in the second half of 2013 compared with the second half of 2012, according to the Alliance for Audited Media, which tracks 417 consumer magazines. Paid subscriptions, which make up 90% of total circulation, were essentially flat in the second half of 2013 (down 0.3%) at 158 million copies. Meanwhile single-copy sales dropped around 10% for the second half of 2013 — to 18 million — after an 8% and 9% decline in 2012 and 2011 respectively. On the advertising front, the numbers are also discouraging. Based on the most reliable measure – the number of print ad pages sold — the industry’s multi-year slide continues. Total ad pages for the 207 magazines tracked by the Publishers Information Bureau, fell 4.1 % to 145,713 pages for 2013, following a sharp decline of 8% seen in 2012. Ad pages dropped another 4% in the first quarter of 2014. And these declines come only a few years after the ad pages plummeted in 2008 and 2009, when they dropped by 12% and 26% respectively. The news is somewhat better on the digital side. Consumer magazines’ online and mobile ad revenue is expected to increase by 22.4% to $3.9 billion in 2014, while digital circulation revenues, including digital subscriptions, are projected to enjoy a 42% boost to $743 million, according to PricewaterhouseCoopers. But for now, digital dollars remain just about 10% of the overall revenue pie for magazines and have not offset the print losses, according to the latest data from the investment firm Veronis Suhler Stevenson. The difficult economic climate in the industry has taken its toll on magazine jobs in the past decade. Overall employment on both the business and editorial sides of U.S. magazines fell 3% in 2013, following a 4% decline in 2012, according to Advertising Age’s analysis of recent Bureau of Labor Statistics data. 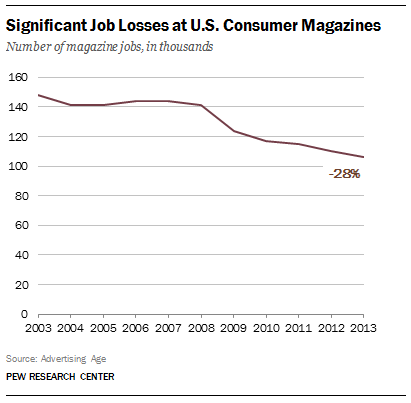 Over the longer term, consumer magazines have shed a total of 41,500 jobs since 2003 (a 28% drop). A number of those jobs were lost at Time Inc., which shed approximately 500 workers in February 2014. And just days before the spinoff, People magazine cut about 12 staffers, and the publisher of All You and Cooking Light left the company.